More premises across North Lanarkshire can now upgrade to faster fibre broadband through the £428 million Digital Scotland Superfast Broadband rollout. Thanks to the programme, more than 890,000 premises are able to connect to the new network, which has now arrived in Greenfoot for the first time. Other local areas to receive further deployment include Cumbernauld, Motherwell and Airdrie. Across the country nearly 4,500 new fibre street cabinets are now live and more than 11,000km of cable has been laid by engineers from Openreach, Scotland’s digital network business. Fibre broadband offers fast and reliable broadband connections at speeds of up to 80Mbps1 and there are many suppliers in the marketplace to choose from. Local people need to sign up for the new, faster services with an internet service provider, as upgrades are not automatic. 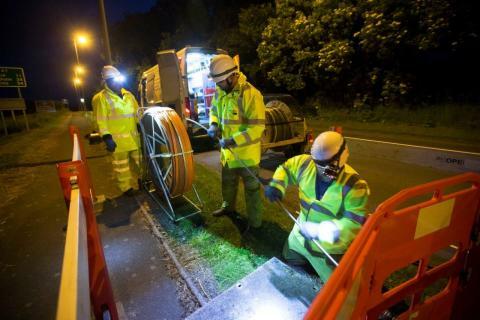 As part of the local rollout in North Lanarkshire some ultrafast Fibre-to-the-Premises (FTTP) technology is being deployed. FTTP sees fibre connected directly from the exchange to the premise and is capable of carrying speeds of up to 1Gbps2. FTTP is being deployed by the programme in only a handful of areas where it is the best technical solution for the area. Councillor Allan Graham, Convener of the Enterprise and Housing Committee at North Lanarkshire Council, said: “I am delighted that more areas across North Lanarkshire can now access fibre broadband thanks to the programme and more people are now able to get a superfast speed. Whether you are downloading a box set, a small business making transactions or just keeping in touch with friends, fibre broadband can make it all happen easily." “Many of these latest lines have been converted from a format once thought incompatible with high-speed fibre broadband, and we’re increasingly using ultrafast Fibre-to-the-Premises (FTTP) to deliver the network directly into individual dwellings, with some properties in places like Motherwell and Cumbernauld among those to benefit. “Finally, we are still bringing fibre to some small communities for the first time, such as Greenfoot.